Guests often travel from all over the country, if not around the world, to attend resplendent destination weddings in Florida, so it’s important they feel welcome and at home when they arrive. That’s where a welcome kit comes in. Below, we share our essentials for assembling a welcome bag your guests will love. Packaging sets the tone for the theme of the welcome bag and wedding. Although it’s traditionally called a welcome bag, some brides and grooms are utilizing anything from lunch containers to vintage boxes. A monogram or logo can be used again and again to brand your wedding day and leave your signature mark. It also makes it easier to label and customize your welcome bag picks. What better way to welcome guests to the area than with local items? Some ideas include wine, honey, cookies, potato chips, and soap. 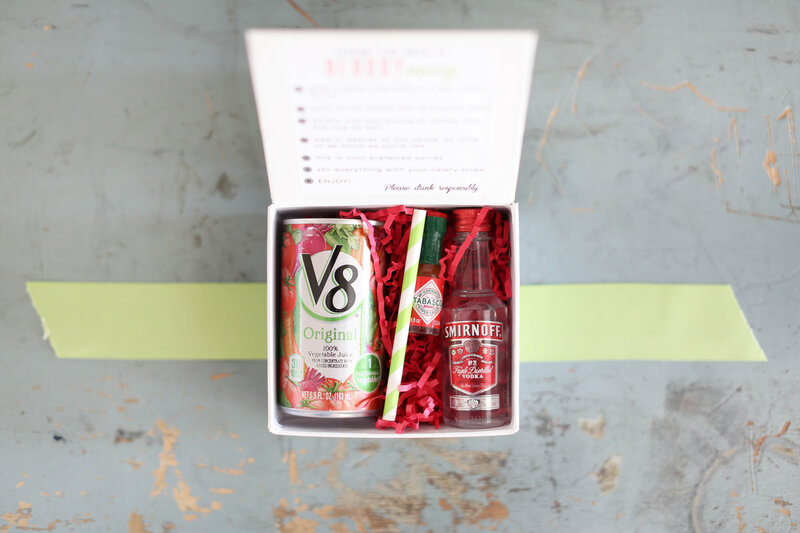 Most welcome bags include some kind of beverage, such as water, wine, mini liquor bottles, or entire drink kits like this mini Bloody Mary kit. You can never go wrong with food, so try incorporating a selection of your favorite sweet and savory snacks. Design a packet or card with information about your wedding. Include maps, itineraries, a suggestion list, and more. This way, guests will be filled in on every aspect of the weekend. It’s hot down here! Stuff your welcome bags with sunscreen, aloe vera, towels, and koozies – anything your guests may need to have fun in the sun. Include a stamped postcard in each bag so guests can send a jealousy-inducing note home. If you’re planning a reception with a long night of after-partying, your guests will appreciate recovery items such as aspirin and water for the morning after. Lastly, don’t forget to slip in a sincere thank you note. The more personal you can make it, the better.